Diseases carried are as follows: Campylobacter, Chlamydiosis, Escherichia Coli, Ornithosis and Salmonellosis. 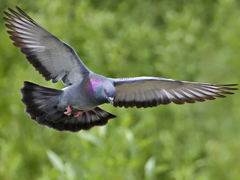 Reasons for control: birds are vectors for transmitting pathogens. They can contaminate surfaces with their fouling. Up to 26 species of insects and mites can be found in nests and roosting areas. Health and safety is a major issue as people can slip on fouling and litigation could ensue. Fire escapes and stairways safety could become compromised. Decorative buildings can become roosting sites for birds which can be stained and damaged by the acid in bird faeces and lead to major costs on pointing and painting.